Wigan frontman Hugo Rodallega is at risk of leaving Wigan next summer on a free transfer if his future is not resolved before the upcoming January transfer window. The Colombian has been linked with the gunners, most recently being in the recent summer transfer window and would be considered the back-up to Robin van Persie if he were to be signed due to Chamakh’s poor form and Park’s lack of playing time in the Premier League. We want it resolved before the January window. Hugo’s still assessing his options but we hope he will stay. 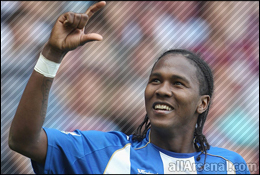 As well and Arsenal and Liverpool, Rodallega is also reported to be attracting interest from Everton and Juventus. The Colombian has been Wigan’s most potent attacking force since joining in 2009 and would be considered a decent back-up for Robin van Persie, but surely Podolski would be preferred especially with the uncertainty surrounding the Dutchman’s future. What do you guys think? Would signing Rodallega be a good move? Feel free to leave a comment below!